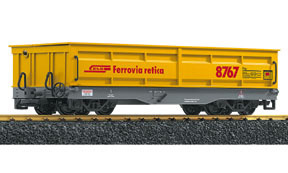 These “mini-quad” cars may be small, but long trains of these cars carry big loads of iron ore from the mines to the mills. 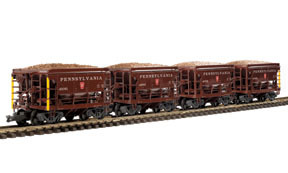 This package includes four finely detailed cars, each with different car numbers, in Pennsylvania Railroad livery. 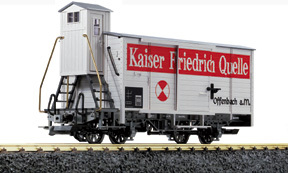 Use them with your LGB Mikado, F7 or Alco locos. Opening unloading hatches. 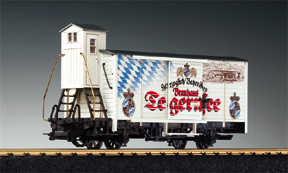 This distinctive "Kühlwagen" advertises a brand of mineral water. Opening doors for both the loading area and brakeman’s cabin. 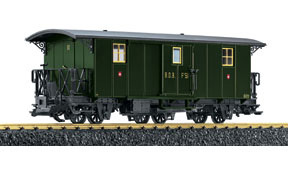 The Dampfbahn Ballenberg features fascinating steam rack locos hauling historic three-axle cars, including this postal/baggage car. A sophisticated undercarriage allows this beautifully detailed LGB car to negotiate even the tightest LGB R1 curves. During the construction of the Vereina tunnel, the RhB needed cars to haul the excavated material. To do the job, this LGB model has a large load bed, and one side can be raised manually to dump the load. 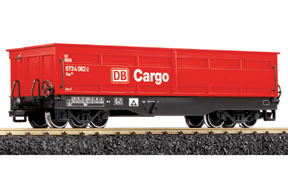 An MTS decoder is built into the metal-wheeled car, and you can operate the mechanism on an LGB Multi-Train System layout using a Loco Remote or Universal Remote. 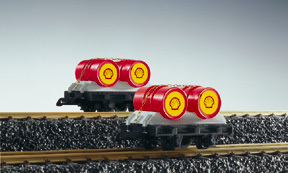 The model is also equipped with changeable buffers: dual buffers for use with the modern DB 101 series locos and single buffers for use with other locos. 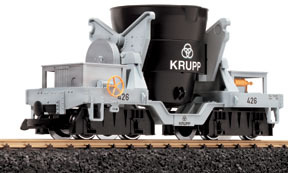 This LGB model has authentic Krupp’s markings and details, and something special: a motorized kettle that can be tilted by remote control on an LGB Multi-Train System layout using a Loco Remote (55016) or Universal Remote (55015). An MTS decoder is built into the car, and metal wheels provide power pick-up. Carry critical liquid loads anywhere on your layout. Removable barrels with safety chains. This intricate design advertises a popular Bavarian brewery. Opening doors.